Hi! 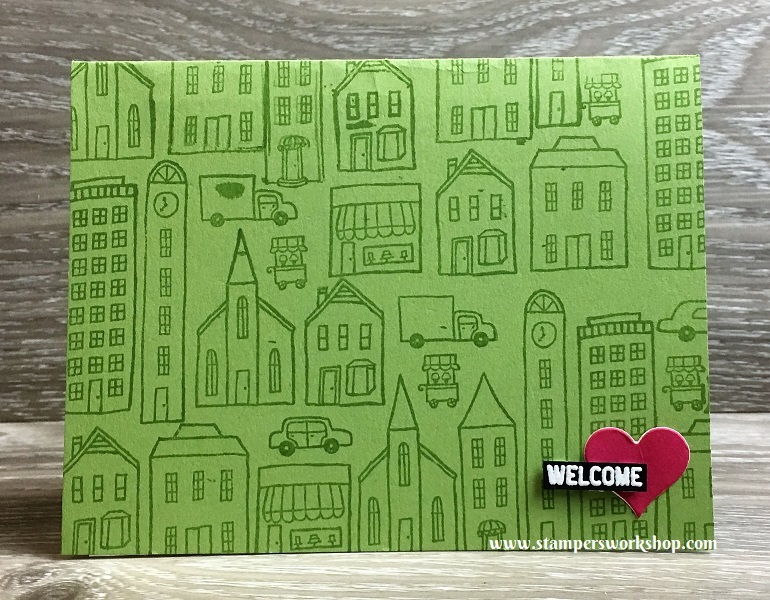 The “In the City” stamp set is one of my favourites of the Hostess* sets on offer in the current (2017-2018 Catalogue). The stamp set is a two-step stamp set meaning that you can stamp the outline and then stamp the inside of the images. However, don’t think you have to use it this way. You could simply stamp the outline, and leave it uncoloured. You could stamp the outline and colour with any other medium or you could always use the stamps to stamp the colour. It is fabulous to have so many options. Another benefit of this stamp set is that it is so versatile with regards to themes. The accompanying sentiment stamps cover a range of themes such as birthday, baby, and wedding. It is also a fabulous set for welcoming a new neighbour. 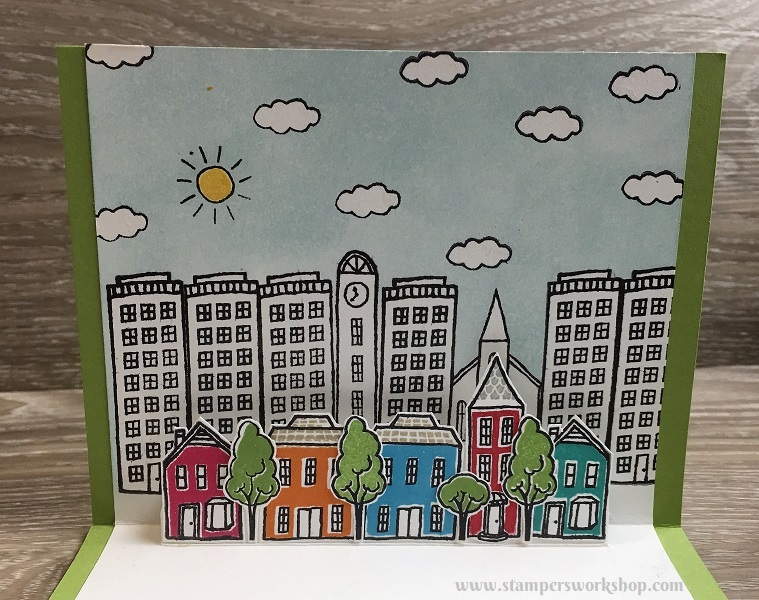 Today I am sharing three similar cards using this stamp set and we are going to step up the look each time. For this card, I simply stamped the outline images all over a background. Doesn’t it look effective? 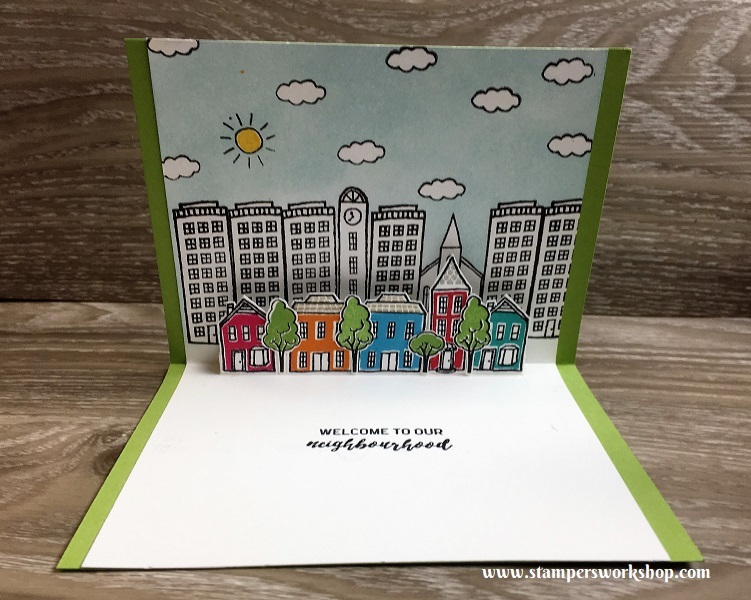 Materials Used: Stamps – In the City (143771), Dies – Sweet & Sassy Framelits Dies (141707); Cardstock – Basic Black, Whisper White; Ink – Basic Gray, Whisper White, Rose Red; and Wink of Stella – Clear. For this next card, I decided to use the solid stamps to give the buildings a bit more dimension. I stamped with grey ink so that the background wouldn’t be so dark. 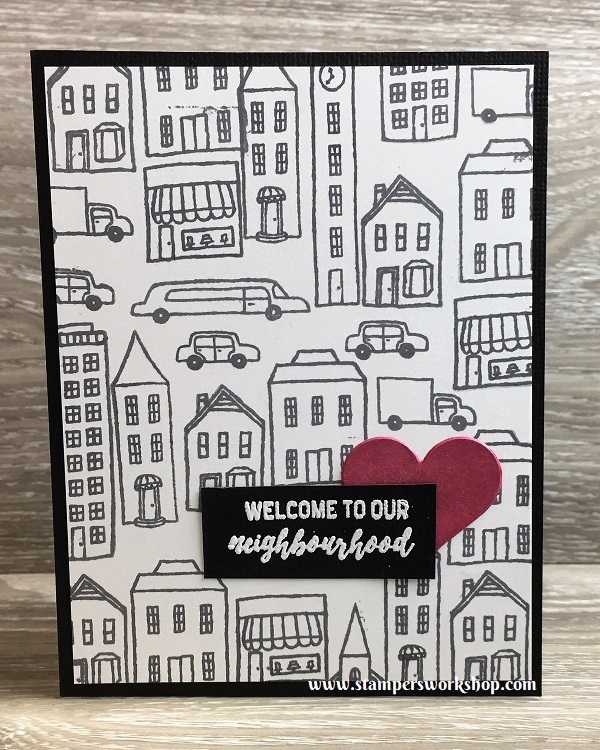 Materials Used: Stamps – In the City (143771), Dies – Sweet & Sassy Framelits Dies (141707); Cardstock – Basic Black, Whisper White; Ink – Smoky Slate, Whisper White, Rose Red; and White Embossing Powder. For this next card, I knew I wanted to create a little scene on the front. So that the background wasn’t too overwhelming, I used the grey ink again but this time left out the solid stamp. I think this is such a pretty card. 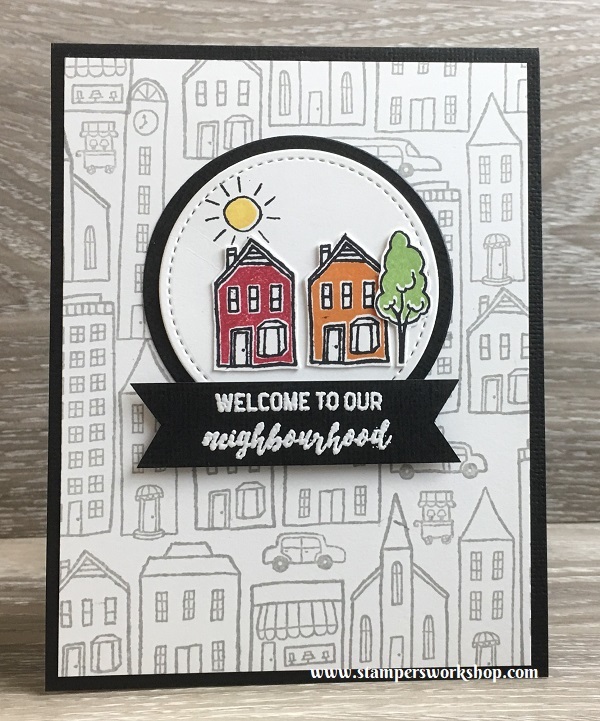 Materials Used: Stamps – In the City (143771), Dies – Layering Circles Framelits Dies (141705) , Stitched Shapes Framelits Dies (145372); Cardstock – Basic Black, Whisper White; Ink – Smoky Slate, Whisper White, Real Red, Wild Wasabi, Crushed Curry, Pumpkin Pie; Triple Banner Punch and White Embossing Powder. 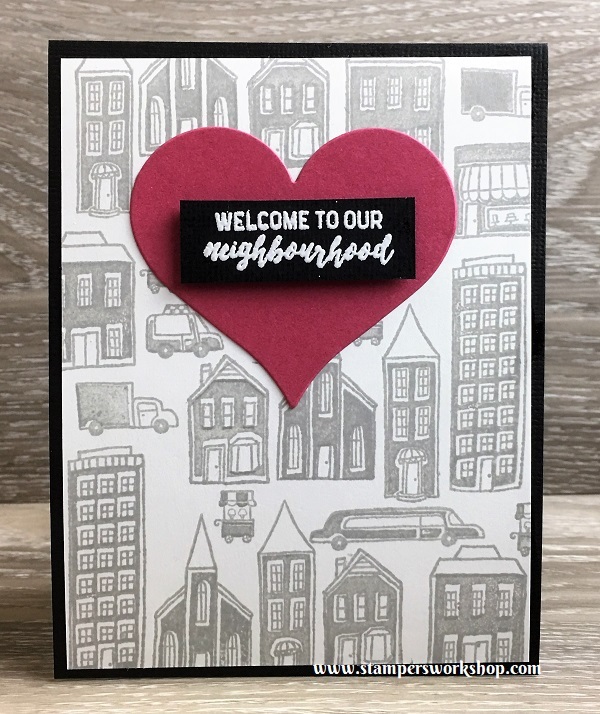 So here are three very quick and easy cards you could easily whip up to welcome a new neighbour. Or swap out the sentiment and send it off to someone to thank them for having you stay. Such a fabulous stamp set! 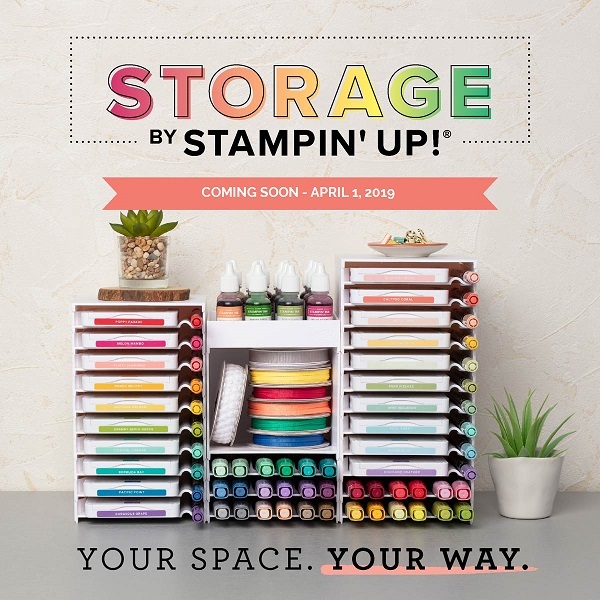 I have so many more ideas using this stamp set and hope to share them with you soon.